I love filling up baskets whether it's for a holiday or to send someone a pick-me-up. I think they're just a whole lot of fun to curate and put together. So Easter baskets are a favorite thing of mine to assemble! 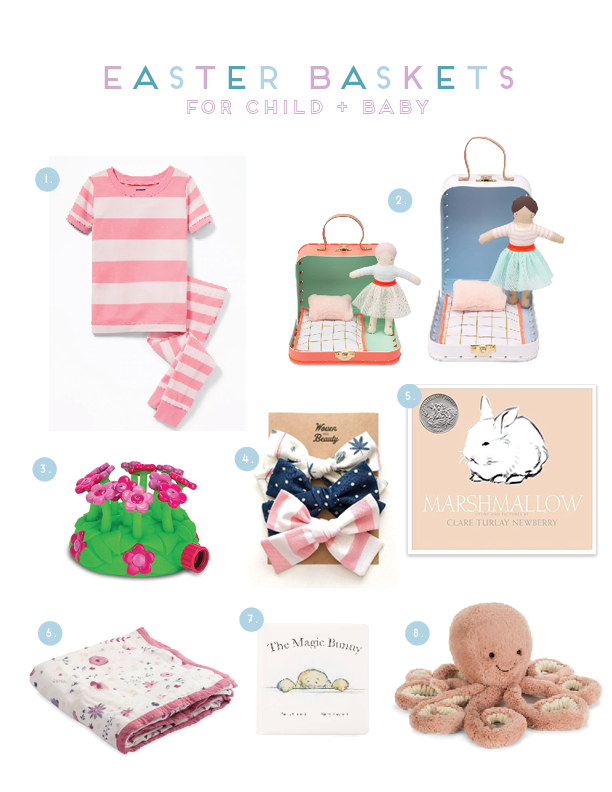 We try to include items the girls need (like pajamas) along with items they use everyday (like bows) and books (because they love reading), and then throw in some whimsical playful pieces. Since the warm weather is settling in, I also like to make sure some of those play toys can be used outdoors! one. Pajamas, how I love them!! Even more so now that I can match the girls in them. This year, their baskets will include this rainbow striped set (because Greer is currently obsessed with rainbows). two. Dolls have become quite the lovies in our home, and I love the idea of these little trinket dolls. Greer will be obsessed. She loves anything she can tuck away and carry around. And these are darling. three. My girls love the water, and there's nothing better than a sprinkler for the summertime. With Greer being older and getting the hang of hand-eye-coordination, I love this set for summer play too! four. We're bow crazy over here! I always like to gift the girls seasonal bows, and this is the cutest set! five. We are big readers, and books are not only a good learning gift, but they're also a good way to create some artwork in your home. We'll prop this pretty book on our floating shelves to be admired for the coming months. six. Blankets never go out of style, and someone is always using one. Quinn gets a lot of hand-me-downs from big sister, so sometimes we like to gift her something that is just hers. A blanket is a perfect "just mine" gift. seven. This is a perfectly-sized book for little bitty fingers. Now big sister and little sister each have bunny-themed books. eight. Who can resist the softest stuffed animal?! No one! Besides these items, we'll fill the baskets with little odds and ends that the girls might need (like socks or a hairbrush) or something fun (like some chocolate for Greer or a chewy for Quinn). We try to keep the gifts simple and assorted for Easter, and these will make for the sweetest baskets for our girls!